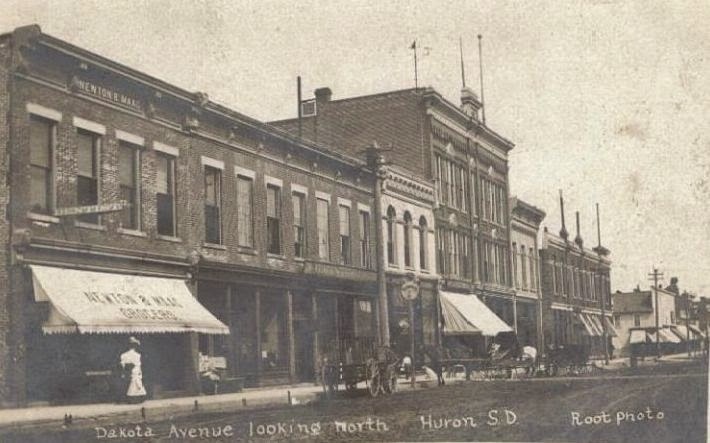 KGDY - Huron's "Voice of South Dakota"
87 years ago, in the back room of a small town pharmacy, Huron, South Dakota's first radio station took root. It was KGDY; the year was 1928, and the place was Oldham, South Dakota. The station, operated by J. Alfred Loesch, and bankrolled by John and William Loesch, was started not only as a public service, but also to promote the sales of radio receivers, which were sold by the Loesch family's pharmacy. Their broadcast day ran from 2 - 6 pm, unless there was a local basketball game; and then William Loesch covered the "home" games, and Lou Loesch called the "away" games. Other programming included local talent, and lots of polka music. And one lone advertiser - the pharmacy. The station experienced its first growth in 1929 when it applied for a 6-fold increase in power, from 15 watts to 100 watts, and for permission to move the station to Huron. The Federal Radio Commission granted that request in March of the following year, and assigned the station to operate on 1200 kilocycles. However, the approval was not easily won, as South Dakota was already over its power quota, but Rep. A. C. Christopherson of Sioux Falls intervened on behalf of the station. The extra wattage was estimated to result in good reception for 200-300 miles. The work of moving the station began, with a formal opening planned for August 1, 1930, with engineer Alfred T. Nelson of Oldham coming to Huron as the chief engineer. J. Albert Loesch was the president of the new company, the "Voice of South Dakota." Dual 80' towers were erected 3 miles north of Huron, just south of the Huron Country Club, and a studio was set up downtown, above the Golden Rule store. The book "Huron Revisited" lists the location to be the upper level of 351 Dakota, and the local newspaper gives the address as 345 Dakota S., but city directories give the address of 347 Dakota S., above the Wright Land Company, which sat next door to the Golden Rule store, and probably shared the building. The above photo, unknown year, shows the 300 block of Dakota Avenue S. In 1930, the taller, 3-story Wheeler Drug Store was located at 339, with the Golden Rule store and Wohl Shoe store in the next building to the left at 345, and the Wright Land Company and KGDY studio at 347. 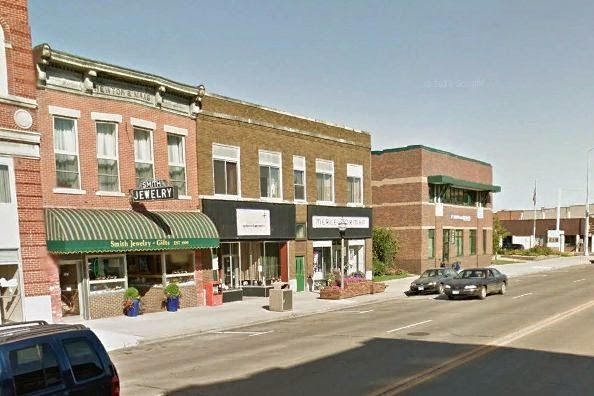 The next building to the left appears to have housed Waibel Hardware (351) and Betts Osteopathic (353), and the Newton and Maag building at far left, home to Smith Jewelry (357), and Wagner Draperies and Inez Jones, milliner (361). Below is a photo of the area in more recent times, courtesy of Google Maps. The new studio included a 50 seat auditorium with a glass wall separating the audience from the broadcast area; within the broadcast area was a glass booth for the announcer. The cost for the studio and the towers was $14,000. The station operated on 100 watts of power, but that amount could be stepped up to 500 watts on short notice. Despite the increase in power, the company reiterated that this new station would not interfere with others that Huron residents enjoyed hearing. KGDY would be located on the radio dial near KSOO of Sioux Falls. The formal opening of the station was slightly delayed from August 1 to August 29, but a large celebration was planned to commemorate the event. The broadcast day would run from 7 a.m. until "late at night," and the first day would feature not only prominent speakers, but local musical talent. Among the speakers were Dean C. Larsen of the State College; Frank D. Kriebs, S. D. State Secretary of Agriculture; U. S. congressman Royal C. Johnson, and Huron mayor E. T. Gitchell. Among the musical artists taking part were Mrs. C. E. Coyne, Mrs. R. W. Gibson, Mrs. Genevieve Trask, Miss Lois Gitchell, Beryl Kinkead-Stratton, Robert Bryan, Mrs. Max Royal, Winnifred Brewer of Woonsocket, the Huron College String Ensemble, D. J. O'Connor the "one armed fiddler of Miller," Phylis and Junior Boughman of Highmore, several dance and old-time orchestras, as well as Eddie and Jimmie Dean, the famous Coffey Boys, who were billed as "the most popular radio entertainers in the northwest." Community excitement was high, as evidenced by the number of flower bouquets, telegrams, and telephone calls received. The radio station was even used as an alibi in a bank robbery, when suspect Ed "Hungry Slim" Vandiver claimed to be singing on KGDY when the Merchants National Bank of Hatton, N.D. was robbed on September 14, 1932; however, no corroborating record of his performance on KGDY was found. In March of 1933, the station was granted another increase in power from 100 watts to 250 watts. George W. Wright, then president of Voice of South Dakota, said the station would need to go off the air for four weeks while the improvements were being implemented. The station would be changed to a regional channel at 1340 kilocycles, and a mid-April re-opening was anticipated. Unfortunately, just days later, fire broke out in the KGDY studio, resulting in heavy damage in both the studio and the Golden Rule store below it. The store stocked ready-to-wear women's clothing, and both inventory and fixtures were heavily damaged by smoke and water. The store carried insurance adequate to cover the losses. It was a different scenario with the radio station, however. The studio equipment was completely destroyed - a $2500 loss. Insurance coverage amounted to $1,000. In addition, the building sustained roof and wall damage. The cause of the fire was never determined. The station was then sold to the Greater Kampeska Radio corporation of Watertown, and Robert J. Dean was appointed station manager. The station had not broadcast since the fire five months earlier. It was anticipated that the station would "open soon." The last signoff of KGDY occurred in 1936, and was witnessed by G. W. Chitty. That summer, Chitty learned that the station was up for sale, and he came with an interest in making the purchase. However, he was not impressed with what he found. There was still no studio in town, and the station had been broadcasting from their transmitter north of town due to problems with the local phone company. The FCC had condemned their equipment and the owners had until Feb. 1, 1937 to replace it. The station was in terrible condition - the only asset being their permit to operate. For this reason, Chitty made what he considered to be a reasonable offer, and it was refused. But the owners did agree to let him manage the station until the new equipment was installed. Chitty immediately settled the dispute with the telephone company and got the phone service restored; he then located studio space on the second floor of the old K.P. Building (later the Farmers & Merchants Bank building), and got the old equipment moved to the new space. But the FCC's deadline was nearing, and there was no sign of any progress in securing the new equipment. The owners at that time (Dr. Koren, Robert Dean, and Mark Plowman of Watertown) were impacted by the Great Depression and it is believed that a lack of funds was the chief problem. On January 31, 1937, the federal government ordered KGDY to cease operations at the end of the day. Chitty remarked, "Huron's radio call letters were not to be heard again until June 30, 1947, when we put KIJV on the air."